Studios are quite amazing – and perhaps even underappreciated – for their immense versatility. They’re inexpensive to rent, offer all the same luxuries granted to the other apartments, and they give an amazing spot to live in, whether you’re new at owning your own place and want to still build up your savings, are moving into a new city to get the feel of the environment and culture, or are even doubling up on homes to have a neat place to crash in closer to your office on tough nights. Whatever the reason, Vela has the luxury studio apartment in Tempe to help you get started. Our studio floor plan, the E1, is made for both efficiency and style. It offers a pleasant 543 square feet of living space, more than enough room for a single resident to relax and arrange their furniture however they please. The main bedroom features a privacy sliding door, allowing you to rest in peace and quiet, and it connects right to the main bathroom, which features a large soaking tub perfect for long bubble baths and an expansive walk-in closet for organizing all your outfits and footwear. Try out a new recipe or go for a classic comfort meal in the open concept kitchen, with ample cabinet space to stock your groceries and cookware. Finally, lounge back and enjoy your free time in the vast living room, with a Juliet balcony great for letting in fresh air and plenty of room for your favorite couch, TV set, dining table, and more. Go for the deluxe studio life at the Vela. 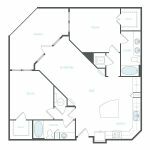 Browse our luxury one of our studio apartment in Tempe floor plans today.